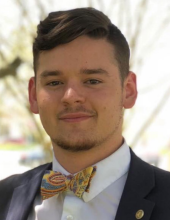 George Apostolos Grekos, 21, of Danville, Va., passed away on Wednesday, October 17, 2018, at Carilion Roanoke Memorial Hospital. George was born August 19, 1997, in Danville. He was an Honor Graduate of Chatham High School, where he served as President of Fellowship of Christian Athletes and was a 3 year letterman in football. George was a Junior at Christopher Newport University, majoring in History in the Master’s Program. He was a brother of SigEp and was actively serving IFC as Vice President. George was also serving as an intern with University Events. George had a strong Christian Faith. He loved all kinds of music – he found his peace and found himself in music. He also loved the outdoors, the Boston Red Sox, and the Carolina Hurricanes. George is survived by his mother, Sheryl Dahl Grekos; his father, Apostolos George Grekos and wife, Michelle; his paternal grandmother, Margurete Grekos; his maternal grandmother, Jean Crowe; his sister, Olivia Arnold and husband Drew; and his brothers, Aaron Collins and Noah Collins. He was preceded in death by his paternal grandfather, George Grekos. A celebration of life will be held at 2 p.m. Sunday, October 21, 2018, at Chatham High School Football Field, with Rev. Freddy Vicks officiating. At other times the family will receive friends at 115 Ripley Court, Danville. In lieu of flowers, please donate to the Pittsylvania Pet Center, 11880 Highway 29, Chatham, VA 24531 (www.pittsylvaniapetcenter.org), God’s Pit Crew, 2499 North Main Street, Danville, VA 24540 (www.godspitcrew.org), or charity of your choice. Donation boxes for children’s school supplies will be available at the celebration. Norris Funeral Services, Inc. & Crematory, Mt. Hermon Chapel, 3995 Franklin Tpke., Danville, Va. is respectfully serving the Grekos family. Online condolences may be made at www.norrisfuneral.com. To send flowers or a remembrance gift to the family of George Apostolos Grekos, please visit our Tribute Store. Donation boxes for children’s school supplies will be available at the celebration. "Email Address" would like to share the life celebration of George Apostolos Grekos. Click on the "link" to go to share a favorite memory or leave a condolence message for the family.